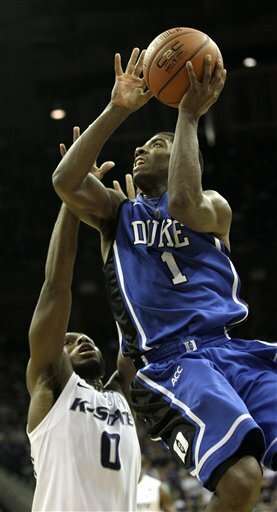 #1 DUKE 82, #4 Kansas State (Wildcats, 18,778 students, Manhattan, KS) 68 – Freshman guard Kyrie Irving and senior guard Nolan Smith both had 17 points and led No. 1 Duke's outstanding defensive effort on Kansas State's Jacob Pullen as the Blue Devils beat the fourth-ranked Wildcats on Tuesday night to win the O'Reilly Auto Parts CBE Classic. Duke (5-0) made sure the sellout crowd of 18,696 at the Sprint Center, most wearing something purple, was never a factor, taking the lead for good 7½ minutes into the game and then going on to lead by 17 points midway through the second half on the way to their 15th straight win. The victory marked Coach K’s 800th. VIRGINIA 74, Oklahoma (Sooners, 20,931 students, Norman, OK) 56 – Senior forward Mike Scott scored a career-high 27 points and grabbed 15 rebounds to lead Virginia to a victory over Oklahoma in a consolation round game at the EA SPORTS Maui Invitational on Tuesday. The double-double was the second of the season and the 20th of his UVa career for Scott. The victory ended a two-game slide for the Cavaliers and improved their record to 3-2 on the season. Oklahoma also has a record of 3-2. #25 NORTH CAROLINA 80, UNC Asheville (Bulldogs, 3,629 students, Asheville, NC) 69 – The young Tar Heels almost handed a sparse Dean Dome crowd (including the executives and family of T.A.H. Worldwide Media) an early holiday turkey but righted the ship to knock off the Bulldogs. Tyler Zeller scored a career-high 23 points and freshman Harrison Barnes added 13 points for the Tar Heels (3-2). But on what appeared to be an easy night, North Carolina couldn't put away the Bulldogs (2-2) and instead found itself protecting a six-point lead with 5 minutes to play. FLORIDA STATE 79, Mercer (Bears, 5,500 students, Macon, GA) 55 – Xavier Gibson tied his career high with 17 points and Derwin Kitchen added 16 points as Florida State cruised to a win over Mercer on Tuesday night. Chris Singleton had 10 points, 13 rebounds and four blocks for Florida State (5-0). Singleton has had a triple-double and three double-doubles in his last four games. WAKE FOREST 81, Marist (Red Foxes, 4,200 students, Poughkeepsie, NY) 59 – Ty Walker had a school-record 11 blocks, and Travis McKie posted his second double-double to lead Wake Forest past Maris in the NIT Season Tip-Off consolation round at the Lawrence Joel Coliseum. With the win, the Demon Deacons even their record at 3-3. The Red Foxes drop to 0-5 on the season with the loss. MARYLAND 72, Delaware State (Hornets, 3,400 students, Dover, DE) 54 – Cliff Tucker scored 15 points, Dino Gregory added 14, and Maryland halted a two-game skid by defeating Delaware State Tuesday night. 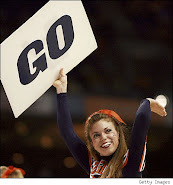 The victory followed successive defeats against Pittsburgh and Illinois last week at Madison Square Garden. Adrian Bowie scored 11 for the Terrapins (4-2), who finished with a 40-21 rebounding advantage and outscored the Hornets 14-7 at the foul line.